This morning, I was listening to the WTOP when an irate caller phoned in about the high salaries that CEO's earned in the past year with their companies failing. Then, talk turned to baseball, and how the commissioner has failed miserably in responding to the current steroid admission from Alex Rodriguez, former MVP, and currently the highest paid player in the league. Bud Selig this...Bud Selig that....How can a head of a such a large sporting organization fail during such a crisis of thesport?? Only the New York Yankees’ quartet of Alex Rodriguez, Derek Jeter, Roger Clemens and Jason Giambi earned more than Selig in 2007. Entering 2009, only seven MLB players will earn more this year than Selig’s $18.35 million of two years ago. Just to give some perspective, deposed AIG CEO Martin Sullivan earned $14 million in 2007, and GM CEO Rick Wagoner earned $14.4 million. Those numbers are only part of the story and do not factor in stock options, investments and severance packages/other bonuses. Its always interesting to compare the sports world with reality (as it is a part of reality, no matter how hard we try to hide it), but what do you think about these numbers? Remember, 18 million!!! i'm lighting candles in my windows for the wretched executives forced to live on a meager 500,000 thanks to fascist totalitarian communist overlord obama. may the souls of our departed forefathers forgive our sins in allowing this fundamental transgression against The Great Free Market, glory be upon it. Don't worry! stripped from the bill! Seriously is there any issue, no matter how publicly popular, that the democrats would be willing to take a stand on? Selig getting $18 mil in one year is an absolute joke. 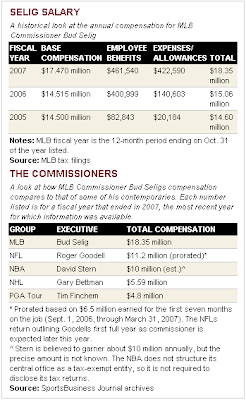 all of the comissioners of the major sports' salaries are exorbitant, but Selig is the most inept and undeserving of them all (though Bettman is oh so close. then again Bettman didn't make $18 f-ing mil!!!). my favorite ESPN anchor (Maryland grad!) Scott van Pelt was recently reprimanded by the company for saying about as much on his radio show... though he did also hilariously make fun of Selig's physical appearance. Oddly, Bud Sellig is a reasonably close relation of a friend of mine. I guess it goes without saying that they enjoy basically the best conceivable seats when visiting him.